Random House Books for Young Readers, 9780385389860, 40pp. STOP RIGHT THERE. Don’t move a muscle, buster. Stay out of this book or I WILL CHOMP YOU! So says the not-so-fierce inhabitant of I Will Chomp You!, a tale of deception, greed . . . and cake! In their funny read-aloud, Jory John and Bob Shea bring a fresh twist to a time-tested blueprint as their little monster threatens, reasons, and pleads with readers to go no further in the book because he will NOT share his beautiful, delicious cakes. Children will identify with the monster’s high valuation of his possessions, and (importantly) will laugh at the silly measures he takes to protect them. 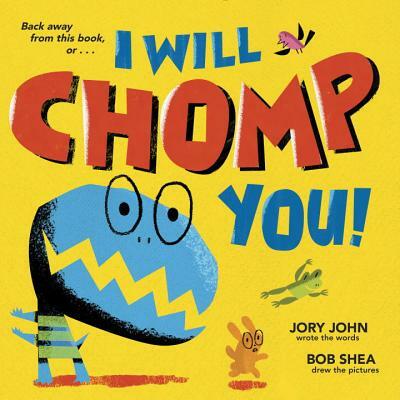 JORY JOHN is the author of the picture books I Will Chomp You!, Quit Calling Me a Monster!, and the E.B. White Read-Aloud Honor Book Goodnight Already!. He is the co-author of the New York Times bestselling novel, The Terrible Two, and the national bestseller All my friends are dead, among many other books. For six years, Jory taught writing at 826 Valencia, a nonprofit writing and educational center in San Francisco. BOB SHEA has written and illustrated over a dozen picture books, including the popular Dinosaur vs. Bedtime and the cult favorite Big Plans, illustrated by Lane Smith. His characters and animations have appeared on Nick Jr., Playhouse Disney, and PBS Kids. Bob spends his days writing, drawing, and having “conversations” with NPR. Never mind a monster at the end, there’s a monster all the way through this book! Starting on Page 1, the protagonist monster uses direct address to warn readers not to turn any pages. The book’s very title reveals the threat behind this warning, and Shea’s toothy monster—all mouth and head and bluster—seems ready to follow through with it. Disobeying the command provokes metafictive peril as warnings to readers persist, and various small creatures depicted on the page (a bird, a frog, and a wee bunny) flee its chomping jaws. The monster misses both them and disobedient readers, growing increasingly angry. Clever illustration choices make it seem as though the monster has chomped through the pages of the book, and soon its commands devolve into pleading. Why? “It’s because I have all my cakes back here, at the end of the book,” the greedy monster explains. In a fiendish ploy to trick readers, the monster offers to share, saying, “just come a little closer…” and a page turn reveals (yet another) “CHOMP!” Defeated, the monster resigns itself to readers’ progress toward the end of the book, and it chomps up all the cakes, leaving it with the just deserts of a bellyache. Throughout, Shea’s vibrant, silly pictures diminish the scariness of the story’s premise and deliver humorous characterization.